So…it happens. Dogs go deaf. Some sooner than others. So it is with Jean-Luc Picardigan, nearly twelve years old but otherwise robust. Well…if you don’t count the brain injury. But it turns out that the brain injury might just matter. My first gone-deaf dog was Strider the Wonderhound, dog of my heart. (You know my Blue Hound Visions web service? Yes, that dog.) Gone twelve years now, but no less beloved–loyal, smart, protective. And who knows how long he’d been going deaf before I realized he’d gone deaf. Why? Because he functioned so well, I never had reason to question whether he could hear or not. He used his young Cardigan companion (Kacey, if anyone’s counting) as a Hearing Ear dog; he was attuned to my body language and my activity, and always responsive to both. Things got even easier once I (duh) finally clued in. Within weeks he was responding to vibrations and hand signals. Soon enough he even did some contextual lip reading–there were still words I had to spell! Enter Jean-Luc Picardigan, these years later. Autistic since a birthing injuring, heavily rehabbed, highly dependent on specialized daily management. Completely “tone deaf” to other doggy body language–and to human gestures. Let’s just say there’s no question about Jean-Luc’s hearing loss. Absent aural cues, he loses us in the house–and doesn’t have the tools to find us, or to leave where he is to find a new where he might want to be. He simply is where he is until he gets enough of a visual cue to act on. On a hard day, he wears a trailing leash–it makes things so much easier for him when he’s struggling to understand. I pick up the leash and his body relaxes. Oh, he says. I can do THIS. Study in contrasts: Strider the lip-reading Wonderhound verus Jean-Luc Picardigan, lost in his own life. Though really, he’s always been a wonder in his own way. Cheysuli Jean-Luc Picardigan OJP NAP OJC NAC CGC started his agility training as therapy–awkward, spatially challenged, and easy to overwhelm–and was never expected to enter an agility ring, never mind earn Open-level titles and his CGC (canine good citizen). 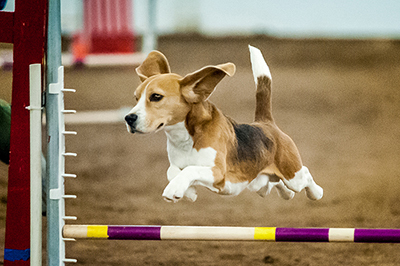 He even won a startling handful of red and blue placement ribbons along the way–he not only ran agility, he ended up loving it and doing it well! So I try not to count him out of the game…and I guess we’ll see how it goes!